Provide comfort for the family of Shirley Gunderson with a meaningful gesture of sympathy. Shirley was born June 19, 1935 to James and Margaret Evans in Tacoma, WA. She passed peacefully in Graham, WA on December, 8th 2018. 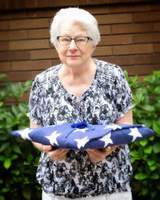 Shirley's family lived in Puyallup until the age of 8. Then moving to Midland where she attended Midland Middle School and Lincoln High School. This is where she met her Highschool sweetheart and future husband Robert (Bob) Gunderson. They were married for over 60 years before his passing. Together they have 4 children Debbie Wilson(Dennis), Jim Gunderson (Heather), Donna Gunderson-Grazzini (Gary), Robert Gunderson (Debbie). During Bob's 20 year career in the Air Force the family lived in WY, ILL, CA, NM, Sevilla Spain, back to Tacoma, and finally settling in Graham, WA. Shirley worked at the Puyallup Library in the 70's and Ed's Moving and Storage until her retirement. Shirley loved to cook and was excellent at it! Especially her famous potato salad. She loved any word games, especially crossword puzzles. She did not like to lose at Pinochle. Shirley is preceded in death by her parents James and Margaret, Husband Bob, and Daughter Donna. Shirley is survived by her sister Janice Evans, 3 remaining children, 6 grandchildren, 7 great-grandchildren and her precious Pekingese Princess. There will be no service held as requested. To send flowers in memory of Shirley Irene Gunderson, please visit our Heartfelt Sympathies Store.